Has it really been three months since my last post? I wish I could say that I had a reasonable excuse, but I really don't. Life has gotten so crazy since moving to Boston. Crazy in a good way, but crazy nonetheless. My days are long and my job is keeping me busy at all times. My routine from my life in Raleigh is a distant memory, which is obviously affecting the regularity of my posts here. Before moving to Boston, I often found myself creating cooking projects for myself to blog about. Living in Boston has been more of an exercise in practicality. Instead of spending 20-30 minutes commuting each day, I spend 2 hours commuting. The time to come home and pull together an extravagant dinner is no longer there. Instead of stopping at Whole Foods on the way home for a spur of the moment meal, my wife and I have begun planning our meals in advance, and spending most of the weekend prepping for a busy week. For a while, I felt that there was nothing really worth blogging about in that situation, but now I'm realizing that it's not really true. I hope to get back in the groove with regular blog posts, even if the subject matter is not as epic as I wish it could be. One of the great things about moving to a new city (or even a new neighborhood) is experiencing a cultural change in your new setting. I had no idea that Boston had a strong Brazilian population, but nearby neighborhoods like Union Square in Somerville show a strong Brazilian population. I have to say that Brazilian food is something that I don't know a lot about, but it has been great to learn about and see the style of food that is in local Brazilian restaurants. 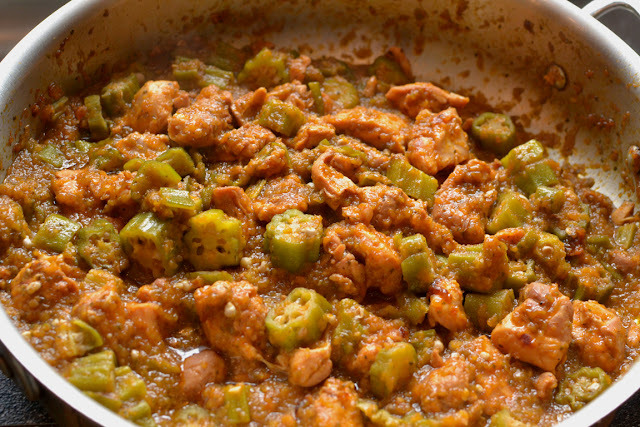 I was looking for something to make for lunch for the week, and my wife suggested recreating one of her favorite dishes from the Brazilian restaurant at the end of our street - stewed chicken and okra. A one-pot dish served over rice, travels well and easy to heat up for lunch, I was all in. I can't vouch for the authenticity of this recipe and I decided to compile parts that I liked from several recipes that I found, so it's kind of a menagerie of ideas but I was really happy with the result. Start by making a marinade for the chicken. Juice the lime, combine with the vinegar and oil, crush 4 of the garlic cloves and add a fair amount of salt and pepper. Whisk to dissolve the salt and marinate the chicken for at least 30 minutes, or as long as overnight. After cutting the okra, rinse and salt it and let it sit for 15 minutes or so. This will leech out some of the stickiness. While the chicken is marinating and the okra is macerating, roughly chop your onion and green pepper. 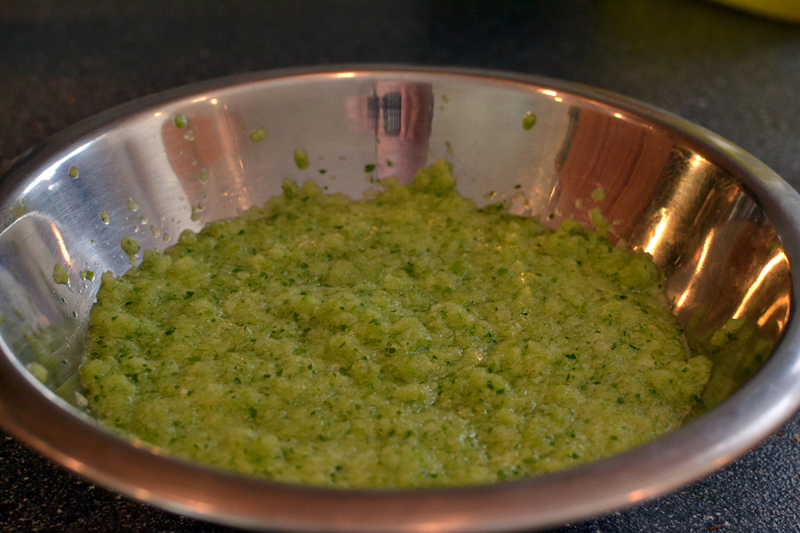 Add to a food processor with the parsley and the last 2 cloves of garlic. Process until you have a smooth paste. 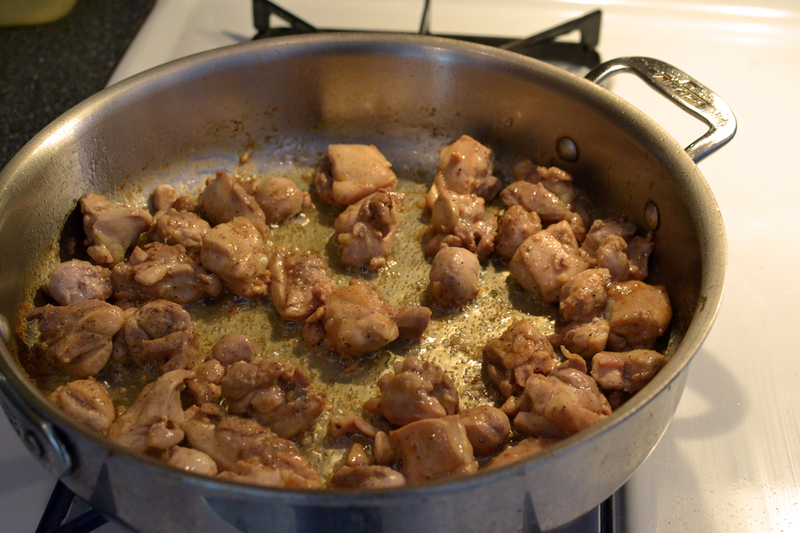 Put a saute pan on med-hi heat and add enough oil to coat the bottom of the pan. Fry the okra for approximately 10 minutes. Let them sit long enough to brown up a bit and then remove them and set aside. Add a little more oil if necessary, and add your chicken. Saute until brown on all sides, then remove and reserve. 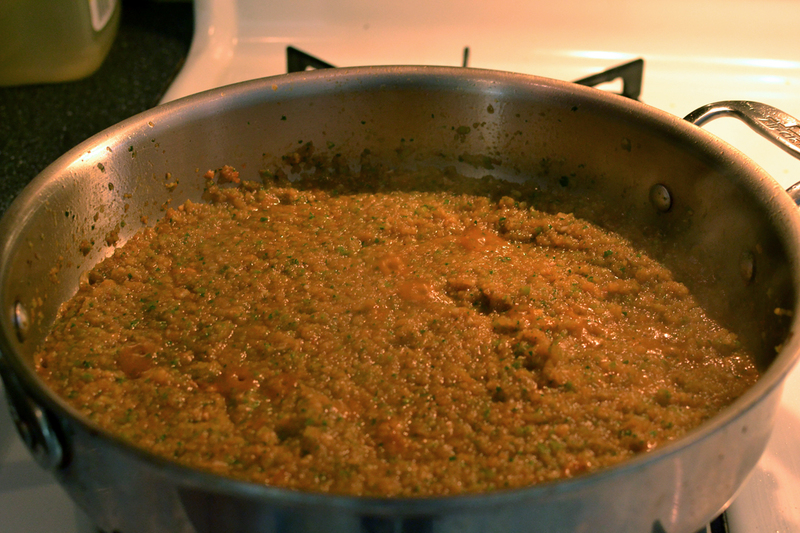 Add the onion/green pepper mixture and the tomato paste and saute for approximately 10 minutes. It took a while for me to get this cooked down, it took longer than I expected for it to not have that sort of raw onion and pepper smell. You will notice that the mixture will start to dry up, then you know it's getting close. Add your chicken back to the mixture as well as the chicken stock. Bring to a simmer, turn the heat down to low, and partially cover. Stew the mixture for 45 minutes or so, until the chicken is nice and tender. If your mixture dries out, add more chicken stock or some water to keep it from burning. The vinegar on the chicken should bring some brightness to the stew and really make it pop. I love the consistency of okra, and the seed bring a really nice texture to this stew. Cheers to trying new stuff and learning something new along the way!